No modifications to transaxle required. 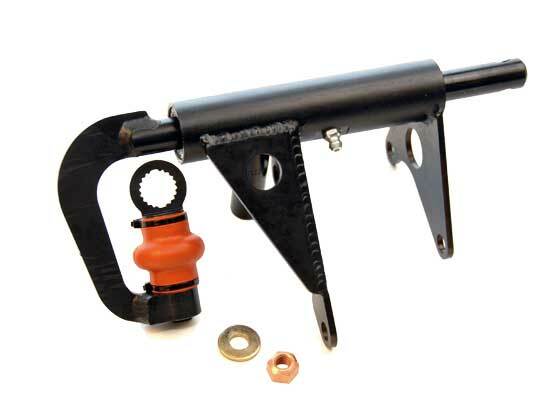 The Weddle Industries 094 Shift Linkage Adapter Kit makes the late model Vanagon transaxle a viable alternative for off-road race cars, pre-runners, and sand rails. It is a bolt on unit that relocates the shift shaft and points it forward on the transaxle; no modifications to the transaxle are required. The rotation and push/pull direction have been designed to use a standard VW shifter in the cab (just about any aftermarket shifter with a reverse lockout will work). The heat-treated shift shaft runs on linear motion ball bearings in a fully sealed bearing carrier. Attached to the shift shaft is a heat-treated, precision ball and socket, protected by a durable rubber boot. The result of this attention to detail is a precise, durable shifting assembly that will continue to shift smoothly, even in the dirtiest conditions. This linkage also works on the Weddle HV1 transaxle, with both rear-engine and mid-engine versions available. Made in USA.